I finally am graduated. Finished. My thesis has been signed, submitted, and accepted. I have been hooded. After my graduation my family and I went over to the Bear's Lair—the only bar on the Berkeley campus—to have a few celebratory drinks (as we tend to do). 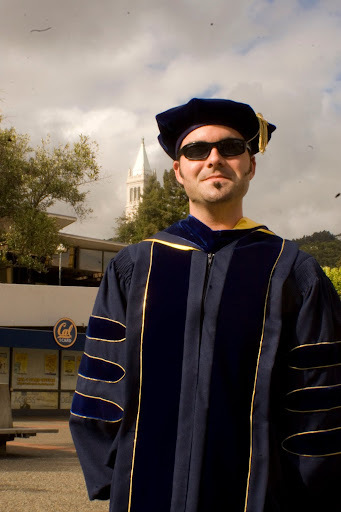 Anyway, as you can see from the picture and video above, the PhD robes are ridiculous. Those blue, velvety robes are officially the most expensive article of clothing that I own. By far. So what do you do when you're dressed like a 14th century clergy/clown and you walk into a bar populated with 22 year olds? You own the look. That's right. As soon as I walked in—I kid you not—a group of students all started chanting "doctor! doctor! doctor!" at me. I can totally get used to this. More people should do that! I joked with a lot of people that my dissertation took me 2.5 days to write. It's totally true! In a sense. I mean, yes, I did spend the previous several years running my experiments and analyzing my data, and then I spent months on each paper that forms my thesis to put together the final statistics, make the figures, and write them... but the thesis only took 2.5 days. Future biographers note: TWO POINT FIVE DAYS. That's how awesome I am. Forget about all the rest of that work I put into it. TWO POINT FIVE DAYS for my PhD in neuroscience!. Anyway, so for those of you that don't know, I'm sticking around Berkeley for a year finishing up some projects and papers, maybe starting another study or two, and then heading over to UCSF to do my post-doc with Adam Gazzaley. My hope is to get a grant this year to fund my research for the next few years. So I'm not moving to Germany (though I still hope to collaborate) and I'll be staying in the Bay Area. Rejoice!